It is long-standing government policy that "B&B accommodation is not to be regarded as suitable for applicants with family commitments" (Homelessness Code of Guidance 2006, [17.28], [17.29]). It is now 14 years since the Secretary of State specified in the Homelessness (Suitability of Accommodation) (England) Order 2003 (SI 2003 No. 3326, made under s.210(2), Housing Act 1996) that when accommodation is made available for occupation under certain functions in Part 7 of the Housing Act, B&B accommodation is not to be regarded as suitable for applicants with family commitments (i.e. for applicants who are pregnant, with whom a pregnant woman resides or might reasonably be expected to reside, or with whom dependent children reside or might reasonably be expected to reside). B&B accommodation caters only for very short-term stays, will generally provide only limited privacy and may lack certain important amenities, such as cooking and laundry facilities. The Code of Guidance provides that is should be a last resort for families, as "living in B&B accommodation can be particularly detrimental to the health and development of children" (at [17.25]), and even then it should be for no longer than a 6 week maximum period. When B&B accommodation is provided, the local authority should notify the applicant of the 6 week maximum and that at that point, "they must secure alternative, suitable accommodation" (at [17.29]). That's the principle, and the policy. But what happens in practice? "Bedbugs, cockroaches and mice. Cooking, eating and sleeping – and sometimes rowing – in one room. Sharing a toilet with eight, nine, 10 strangers. Welcome to family life in bed and breakfast. B&Bs, the jaunty-sounding little hotels which if you pick right can make your holiday, offer something quite different if you’re living in them full time. And latest figures suggest more than 2,000 families with children are doing just that. The highest number in a decade." The numbers have continued to rise since then. In 2016 the number of families housed in B&Bs (3,390) was more than double the number at the end of 2013 (1,560). A very high percentage of these 3,390 families were housed for longer than the 6 week maximum: 1,300 (Department for Communities and Local Government, December 2016 statistics). As the Children's Rights Alliance for England (CRAE) has pointed out, this rise correlates with an overall rise in numbers of homeless families. A new national campaign on children's rights and homelessness aims to change this picture. 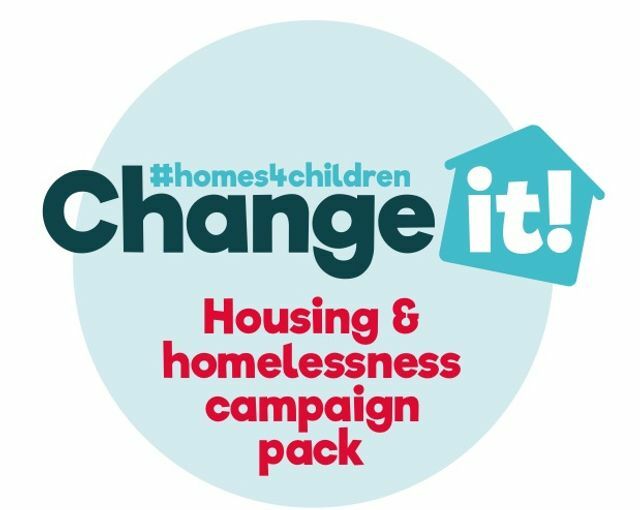 CRAE is supporting a group of 26 children and young people, aged between 8 and 20, who have launched a campaign called Change It! They have developed what CRAE describes as "their unique, child-led campaign" after working together on a report on children’s rights which they submitted to the UN Committee on the Rights of the Child. In June 2016 the UN said the UK Government must take immediate action to "strictly implement the legal prohibition of prolonged placement of children in temporary accommodation." Change it! is calling on the government to listen to the voices of children and young people and to stop families being housed in B&B accommodation past the legal limit of 6 weeks. Many of the children and young people leading the campaign have experienced homelessness and some of them have spent extended periods growing up in B&Bs, in dirty, cold, damp and unsafe conditions. We can and should take action. The Change It! group has a campaign pack packed with ideas - read it, support them and get involved. We also need to challenge local authorities who are flouting the law, in the courts and before the local government ombudsman (LGO). For example, the LGO in one case recommended Birmingham Council apologise and pay almost £4,000 for placing a woman and her 4 children in a one-bedroomed B&B for over 4 months (17 weeks). She had applied as homeless after fleeing her council home in June 2010 because of harassment and threats of violence. It took over a year for the council to accept the woman as homeless, and during that time she was placed in a one-bedroom bed and breakfast accommodation for 17 weeks. £2,000 of the payment was directly linked to the injustice caused to the children for living in B&B accommodation for so long. More challenges like this are needed to secure change. Did you know thousands of children in England are growing up without a home? In places that are dirty, crowded and unsafe for children. Our new Change It! campaign needs your help to stop this. Change It! is led by a group of 26 children and young people from all over England, we are aged between 8 to 20 years old and we come from many different backgrounds. Many of us have faced homelessness and grown up in B&Bs or other types of temporary accommodation. That means we know that a B&B is not a good enough home for a child and that’s why we have set up Change it!, a campaign to stop families with children being forced to live in B&Bs for longer than the 6 week legal limit.